With the success of the VAMPS LIVE 2014: LONDON exclusive screening, Cosplay.PH and Live Viewing Japan are once again teaming up to bring you the much awaited L’Arc~en~Ciel documentary film “Over The L’Arc~en~Ciel”! This exciting event will be held at 2PM on 28th February 2015, at the SM North EDSA Cinema 2 in Quezon City! Over The L’Arc~en~Ciel follows Japanese superband L’Arc~en~Ciel as they travel to 14 cities and perform at 17 sold-out shows all over the world. Besides exhilarating performances onstage, the documentary will also feature the trials and tribulations of being on tour, an in-depth look at the Japanese and international fans, and quiet personal moments with band members. L’Arc~en~Ciel is composed of hyde (Vocals), ken (Guitars), tetsuya (Bass), and yukihiro (Drums). The band was founded in Osaka in 1991 – and has gone on to be one of the biggest bands in Japan. L’Arc~en~Ciel has sold over 15 million records, has toured extensively in Asia and Europe, and were the first Japanese act to headline New York City’s Madison Square Garden. 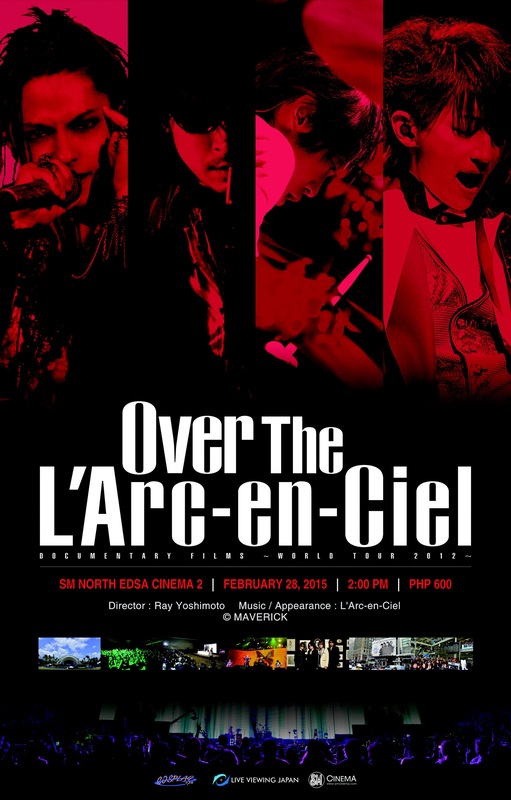 Pre-sold tickets to the L’Arc~en~Ciel documentary film “Over The L’Arc~en~Ciel” screening are exclusively available at SM Tickets outlets or via smtickets.com starting 1st February 2015. Seats are limited so grab yours today!